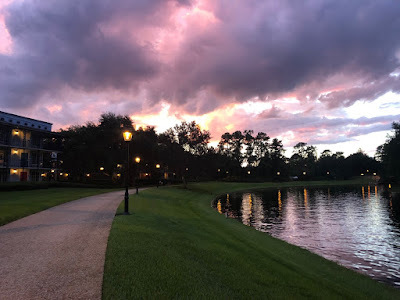 When you talk about favorite resorts at Disney, there's no denying that Port Orleans Riverside is one of my favorite moderates. I love the theming, the atmosphere, and the overall feel of the resort. 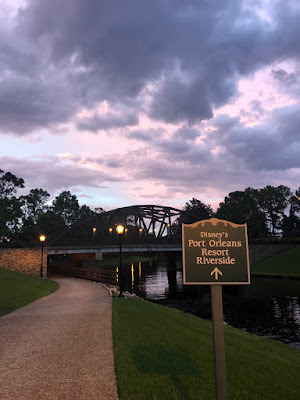 Last August though, my husband and I had the chance to stay on property for an evening before our Disney Cruise, and we decided to stray up the beaten path to Port Orleans French Quarter. Little did I know, this quaint little resort would quickly earn a place in my heart! With its down home southern feel and New Orleans atmosphere, this resort is a must stay in my opinion! Upon arrival, we were immediately greeted with that sweet, southern hospitality you come to expect in the south. Our room wasn't ready yet, but the resort was not full and the cast member was able to find a spot for us which was super nice of him! Port Orleans French Quarter has a quick service location which serves a wide variety of food, along with a few southern favorites. I also seriously loved the Float Works dining hall overhaul! Disney removed the giant Mardi Gras parade heads and replaced them with a sleeker, more modern design. There's even a few "hidden" Disney touches - check out the cards below! Remember when I mentioned traditional southern favorites? I can honestly attest this "new recipe" (as of late summer 2018) is perfect and tastes just like Cafe du Monde. The old recipe? Well, let's just say I'm glad they overhauled that one! 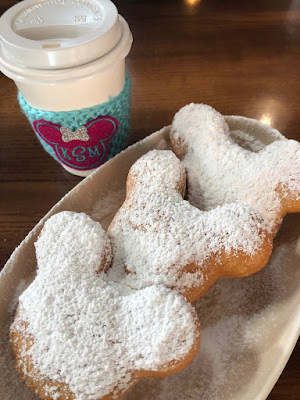 If you haven't tried the beignets here in a while, you definitely need to do so again! Another touch to the southern way of living are the alligator statues located along the property. No, I don't have them in my actual backyard, but I don't have to travel far to find them! The architectural design on this property is on point! Our favorite part about this resort is the size. 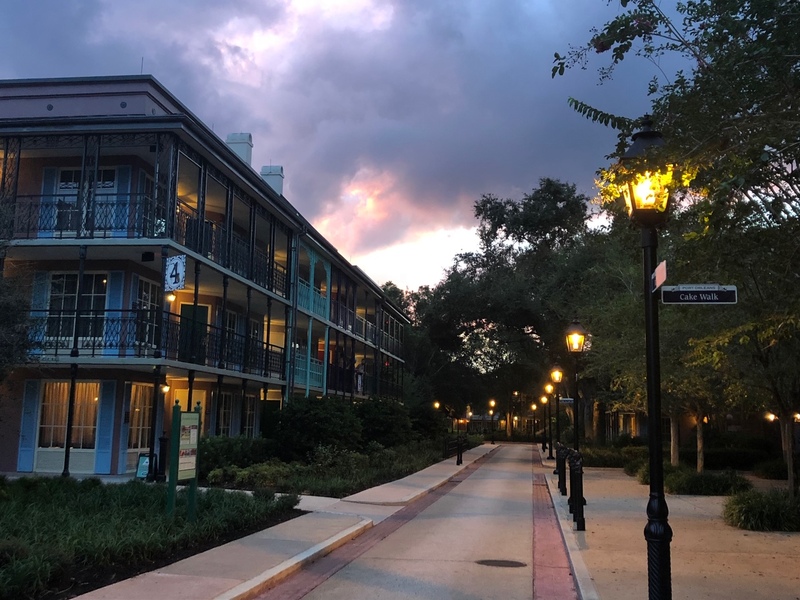 No matter which building you're staying in, you won't have a long walk to get to the dining hall which is super nice! This resort is also super quiet and we loved that! The rooms were recently remodeled which meant no more carpet! Mardi Gras beads were also waiting for us with the traditional hidden Mickey on the table of our room. The bathroom was super spacious and had plenty of room to move around. The only difference with this room was the lack of separate potty/shower from the sink. If one person was in the restroom, you didn't have access to anything else. I'm not sure if this is how all of the rooms on property are, but that's how ours was for sure. Although we didn't have time to explore the pool area, this slide looked like a lot of fun. The laundry facilities are also located alongside the pool. Taking a boat to Disney Springs is also super convenient and very peaceful. You also have a chance spot the Treehouse Villas along the way. The New Balance Running Trail is available at this resort as well. I've run this entire route and it's a good one! This is subject to change, but several of the Disney resorts are offering fun runs on property on certain days of the week. Sadly, we were missing this one by one day. Whomp Whomp. Also noteworthy - there is no workout facility on property which is why the running/walking paths definitely come in handy! The street signs and cross ways were also designed perfectly, along with these guys (below) which you'll find all throughout the streets of downtown New Orleans. As if we thought this resort coulnd't get any more perfect, it did. Once the sun sets at night, the streetlamps kick on and wow. It's breathtaking! So, should you stay here? Yes, yes you should. Living in Louisiana, I've been to New Orleans more times than I can count and always shied away from staying at this resort. Now, I'm sad I didn't get a chance to experience it sooner, I'll definitely stay here again and hope you will consider it as well! Want to read up on other resort reviews here on the blog? Check them out below! The list is ever growing! French Quarter was the first place I stayed when I started to do runDisney. I picked it since I was going with my folks and it was a short walk to everything. It's my go to resort now. They were remodeling the rooms when I was there last in April and haven't stayed in the new ones yet. But the old design did have the sinks separate. It's weird that they would combine them. Wow! How interesting! I wonder if we just got a randomly different room? That's good to know, though!